Roush Fenway Racing’s David Ragan nearly went to Victory Lane in the season-opening Daytona 500, but an ill-timed lane change led to a black flag and a disappointing 14th place finish. 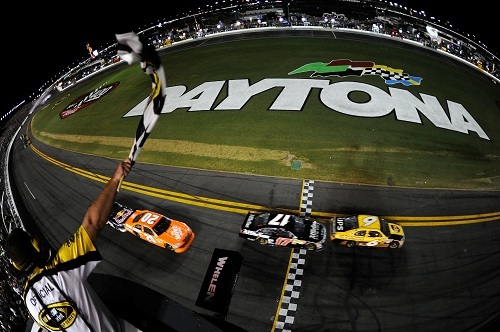 Saturday night at Daytona International Speedway, Ragan was able to make up for his costly mistake and score his first career NASCAR Sprint Cup Series victory. 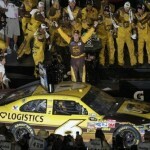 Partnering with teammate Matt Kenseth for the entirety of the Coke Zero 400, Ragan was able to survive three late-race wrecks and two attempts at a Green-White-Checkered finish to accomplish the feat. Ragan and Kenseth were able to take the green flag on the final GWC start lined up nose to tail, while many others jockeyed to find their drafting partner behind them. Taking the lead, the Roush Fenway teammates were able to hold off the tandem of Joey Logano and Kasey Kahne, while two separate wrecks happened behind them on the final lap. The win was a popular one, especially for Logano. He and Ragan raced legends cars as young drivers and have come up the ranks together. The win was also a boost for Ragan at a time when questions linger about UPS’ future with Roush Fenway Racing. Currently in negotiations, team owner Jack Roush said he was hopeful UPS would resign and believe Ragan’s win proved he could get to Victory Lane. 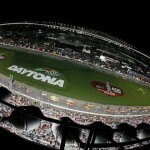 David Ragan: A Movie Script In The Making?